Gallons - Tank Type - (Rectangle) Gallons - Tank Type - (Hexagon) Gallons - Tank Type - (Cylinder) Surface Area - Tank Type - (Rectangle) Surface Area - Tank Type - (Hexagon) Surface Area - Tank Type - (Cylinder) Length: 24 in. Width: 12 in. Fish Body: Slender Fish Body: Medium Fish Body: Large Number of Fish: 24 Fish Length: 1 in. 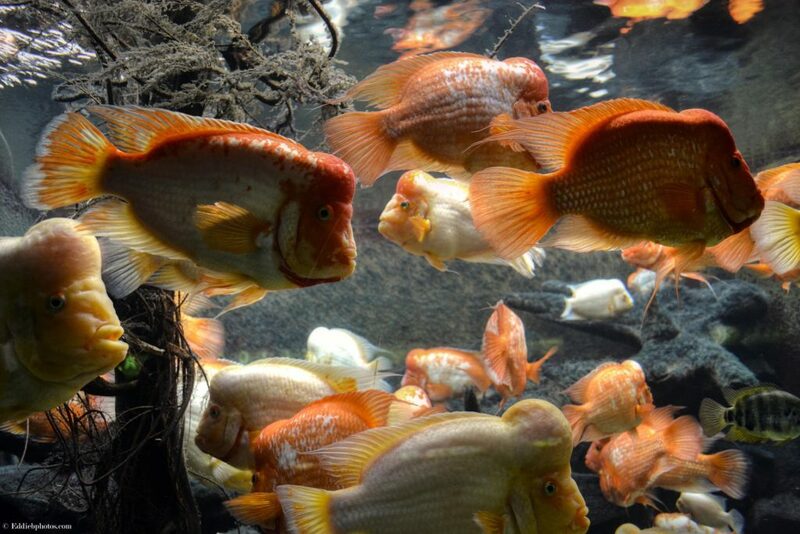 The most often quoted “rule” for how many tropical fish per gallon of water is one inch of fish per gallon of water. This advice works well for most slender-bodied fish, but it is not sufficient for larger wide bodied fish. 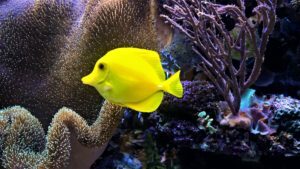 The one inch per gallon rule also only applies to a fishes adult size, and not the size it is when you purchase it as a juvenile. For fish with a less slender build, you will have to adjust the one inch per gallon rule to account for their larger overall size. A fish with a medium sized body will, for the most part, require 2 gallons of water for every inch of body length. While a large wide-bodied fish will need at least 3 gallons of water for every inch their body measures. Another thing to take into consideration is the actual amount of water that is in your tank. While a tank might be rated to hold a certain amount of water, that doesn’t mean it will hold that much when fully setup. 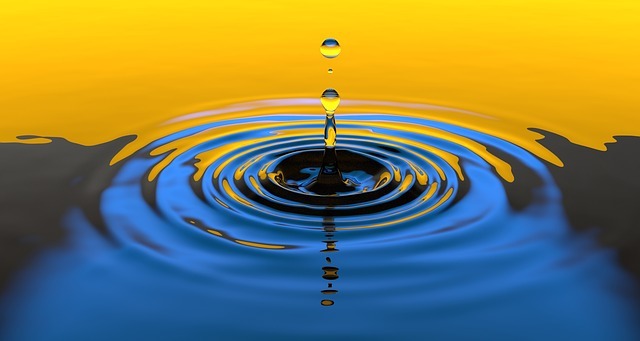 The gravel, decorations, and equipment will all displace water to a certain extent, which will reduce the overall water volume in the tank by up to ten percent. 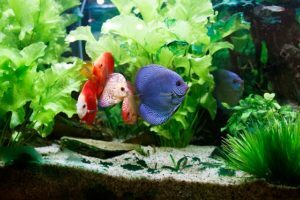 Given that your tank will most likely be holding ten percent less water when it is fully set up, it’s best to consider using that amount as your basis for calculating how many fish you can add. For example say you have a 20-gallon tank, in that case, ten percent of 20 gallons is 2 gallons, so you would base your stocking level on 18 gallons instead of the full 20 gallons your tank is rated for. 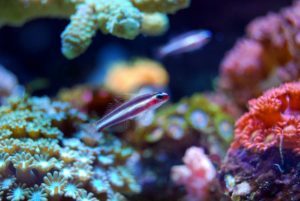 For the most part, the one inch per gallon rule is a quick and easy way to estimate the amount of fish you can add to your tank, but it does have some problems. If you prefer a more scientifically sound method of determining a tanks stocking level, continue reading on for an explanation of the surface area calculation. The surface area calculation is 1 inch of fish for every 12 square inches of water surface area. This calculation will also need to be adjusted for wide-bodied fish to 1 inch of fish for every 20 square inches of the waters surface area . The surface area of a tank can be measured simply by finding the length and width of your tank and multiplying those two numbers together. If you have a specialty tank like a hexagon or a cylinder, all you will need is the side length or the diameter, and then enter it into the calculator above and it will solve do all the work for you. The surface area calculation takes into account the amount of water that is exposed to the air and not just the total amount of water. 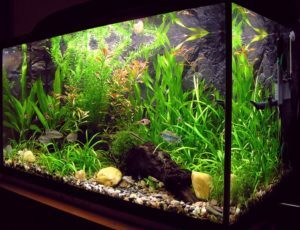 This method gives a more accurate gauge of how many fish can live in an aquarium since oxygen and carbon dioxide exchange can only happen at the surface of the water. 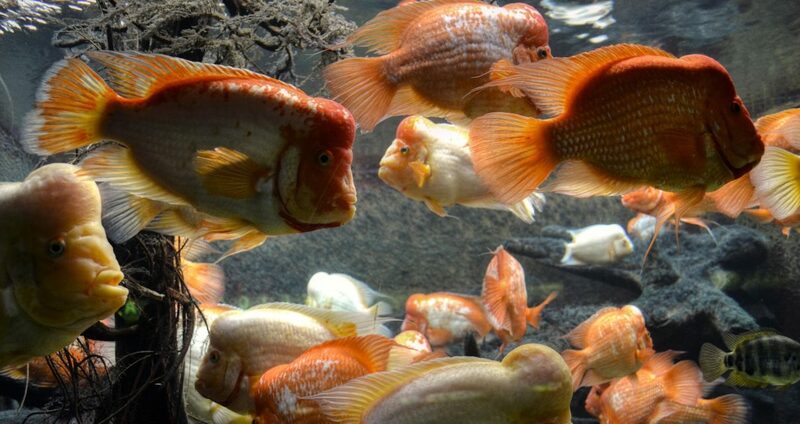 One of the hard limits on how many fish you can have in a tank is the amount of oxygen in the water. If there is insufficient gas exchange to keep the oxygen level constant your fish will struggle to breathe. That’s why the surface area calculation is used in large commercial fish facilities, and for calculating a ponds carrying capacity. While there are things you can do to increase gas exchange like adding and air-stone or agitating the surface of the water. 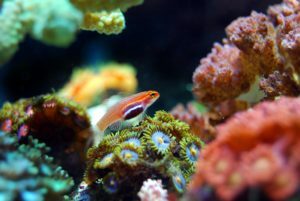 It is still wise to limit the amount of fish in your tank to a level that can be sustained by passive oxygen diffusion. This will help protect your fish in the event of an air pump malfunction or a power failure. 5 in. 2.5 in. 1.66 in. A 5 gallon tank can hold 5 inches of slender fish quite comfortably. 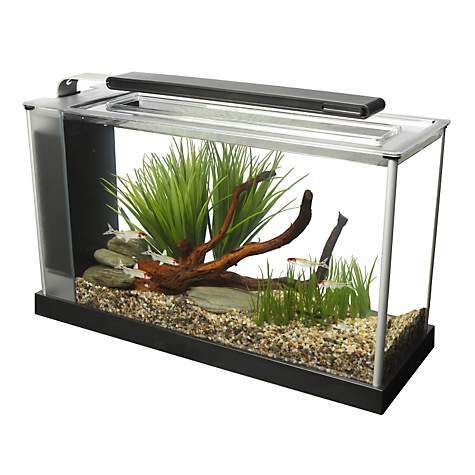 Five gallon tanks are a nice starter tank for a child, or for someone new to the fish keeping hobby. 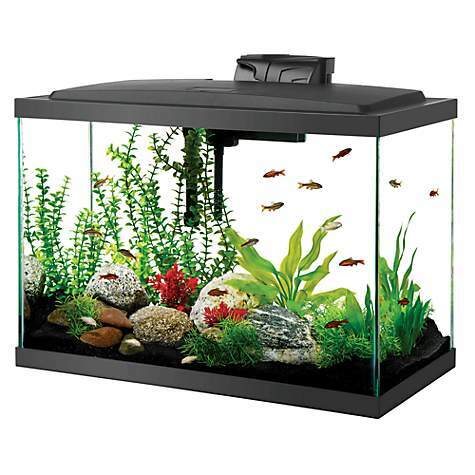 A five gallon tank is well suited for fish that remain small throughout their whole lives like guppies or neon tetras. While it might be possible to house medium bodied fish in a 5 gallon tank it is not advisable. The amount of waste they will produce can overwhelm such a small volume of water. A medium sized fish will also be very cramped in a 5 gallon tank since they will have very little room to swim around in. If you want to house the most fish possible in a 5 gallon tank you should consider getting a school of neon tetras. 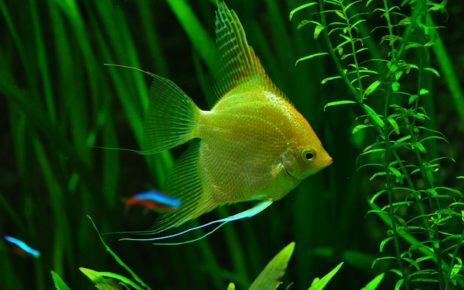 They are very active colorful fish that will swim around all day, and they are very easy to care for making them perfect fish for beginners. 10 in. 5 in. 3.33 in. A 10 gallon tank can hold up to 10 inches of slender fish or 5 inches of medium bodied fish. 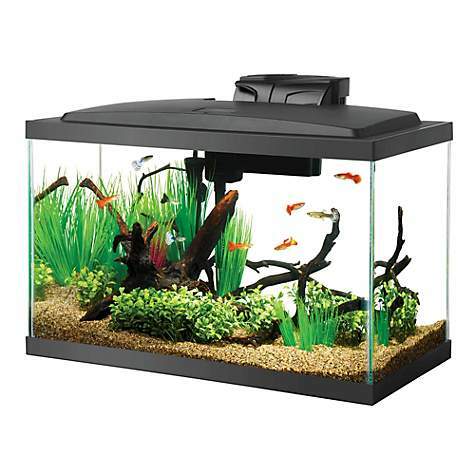 Ten gallon tanks are the perfect tank for holding a small school of GloFish, neon tetras, guppies or platies. 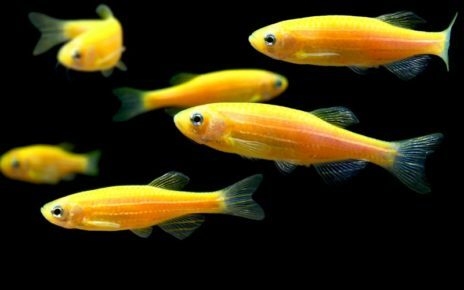 If you plan on getting GloFish you can read our article on how many GloFish will fit in a 10 gallon tank. Or you can mix and match fish like guppies and other slender bodied fish to have some variety. It is possible to keep a medium bodied fish in a ten gallon tank, but it will be a little crowded. You will be limited to five inches of fish in that case, which means you will only be able to keep one fish. This is mainly due to the fact that most medium bodied fish grow to a length of a least 3 to 4 inches, so you won’t be able to keep more than one without pushing the tank to its limits. 20 in. 10 in. 6.66 in. A 20 gallon tank can hold 20 inches of slender fish, 10 inches of medium fish or 6.66 inches of large fish. Since twenty gallon tanks are so popular the question of how many fish can a 20 gallon tank hold comes up a lot. A 20 gallon tank is large enough that you can house medium bodied species of fish or large fish if you really like a challenge. A 20 gallon tank will easily house fish like rainbow sharks, tiger barbs and gouramis. They can also house some smaller cichlids like convicts, blood parrots, and German blue rams. If you still prefer to house as many fish as possible in a 20 gallon tank, then you can get a small school of slender bodied fish which can really fill a twenty gallon tank out. While it is possible to house larger bodied fish in a 20 gallon tank it is not advisable. Since most larger bodied fish easily reach a size of 5 to 6 inches they will be right at the limit of the carrying capacity of a 20 gallon tank. A larger bodied fish will also produce more waste which will require more frequent water changes and filter maintenance. 29 in. 14.5 in. 9.66 in. A 29 gallon tank can hold 29 inches of slender fish, 14.5 inches of medium fish or 9.66 inches of large fish. A fish tank that holds 29 gallons of water is just around the point where you can start considering housing larger bodied fish. Some good fish for a 29 gallon tank are angel fish, South American cichlids or fancy goldfish. You can also mix and match small and medium-sized fish in order to create a more natural look in the tank. When it comes to large-bodied fish a 29 gallon tank is just at the bare minimum you will need to house them. In most cases, you can keep up to two large-bodied fish in a 29 gallon tank without any problems. You will have to keep and eye on water conditions since 29 gallons is still not a lot of water to work with. There also might be more territorial conflicts in a 29 gallon tank since space is limited. 30 in. 15 in. 10 in. A 30 gallon tank can hold 30 inches of slender fish, 15 inches of medium fish or 10 inches of large fish. A thirty gallon tank has just enough room that you can really start to broaden your fish keeping horizons. Some good fish for a 30 gallon tank are German rams, American flagfish and tiger barbs. A 30 gallon tank will also work well with a mix of small and medium sized fish. Another option is to add only small slender fish, in that case you will have a decent sized school of fish which can be quite impressive when they all swim together. If you prefer large fish a 30 gallon tank will easily house certain species of large-bodied fish. You will be able to keep 2 large fish as long as the species of fish you plan on keeping stays under 5 inches when it is fully grown. A better option would be to keep a single large aggressive fish that prefers being kept alone. This will work out well for the fish, and it will allow you to keep a fish that you otherwise wouldn’t be able to. 36 in. 18 in. 12 in. A 36 gallon bowfront can hold 36 inches of slender fish, 18 inches of medium sized fish or 12 inches of large fish. 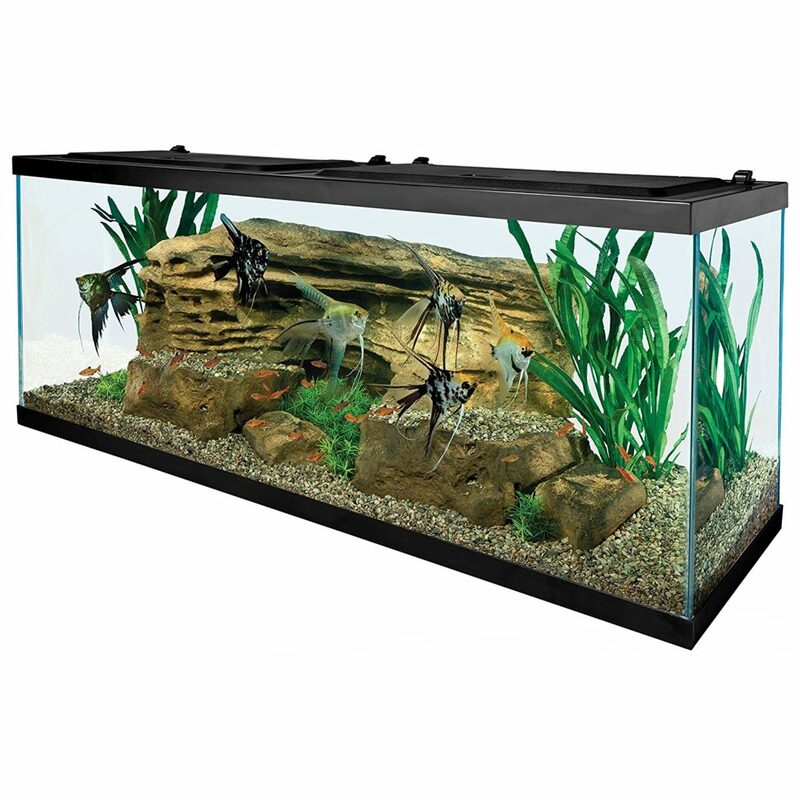 A thirty six gallon bowfront is not only a very attractive aquarium it also holds a decent amount of water. 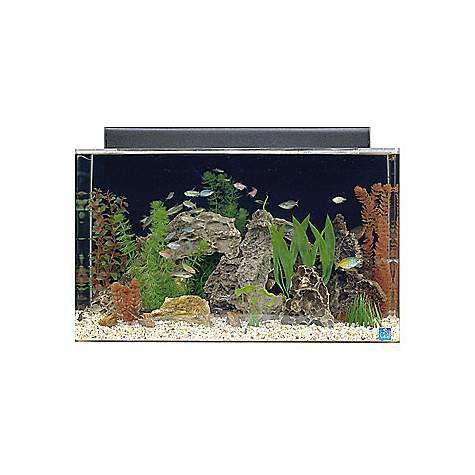 A 36 gallon fish tank has more than enough space to house most medium and large-bodied fish species. Some good fish for a 36 gallon bowfront are African cichlids, South American cichlids and large fancy goldfish. 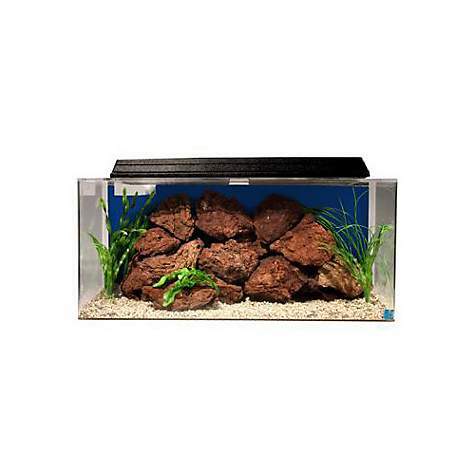 A bowfront aquarium will also be even more impressive when it is fully stocked with live plants, so you also might want to consider adding shrimp and snails and other algae eaters to help with tank maintenance. A 36 gallon bowfront will house a total of 12 inches of large-bodied fish quite easily. If you choose a species of fish that remains under 6 inches you will have just enough room to keep two fish. You could also keep a single fish that will grow to about 10 to 12 inches if you prefer going the route of keeping a single fish as a focal specimen. 55 in. 27.5 in. 18.3 in. A 55 gallon tank can hold 55 inches of slender fish, 27.5 inches of medium sized fish or 18.3 inches of large bodied fish. 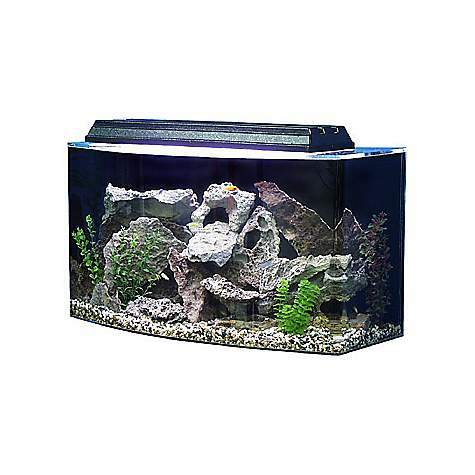 Fifty five gallon tanks are one of the most popular large tanks in the fish keeping hobby. And that is for good reason since they have enough room to keep any size fish you like without taking up a lot floor space. Some good fish for a 55 gallon tank are Discus, Jack Dempsey and Blood Parrots. A 55 gallon tank can also be used to house a large school of small fish, or you can add a mix of small and medium sized fish so you can have fish at every level of the water column. Large fish do especially well in a 55 gallon tank, and in most cases it is the minimum recommended tank size for most large fish species. If you select a large species of fish that only grows to 6 inches in length then you will be able to house three of them quite comfortably. And if you really want to push it you can keep two 9 inch fish in a 55 gallon tank, which is perfect if you want to set it up as a breeder tank.